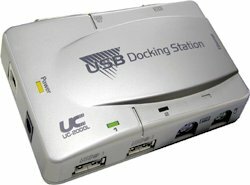 USB Docking Station with LAN - Custom Sensors, Inc. The UC-2000L is an intelligent, stackable expansion module that connects to a PC or Server via the USB port, providing one high-speed RS-232 serial port, one printer port (IEEE-1284 Compliant), two PS/2 ports, one RJ-45 Ethernet port, and two USB ports. The unit features easy connectivity for traditional serial, printer, PS/2, network, and other devices. The UC-2000L is used to add traditional ports missing on the newer PCs and laptops. In addition to the conventional Printer, Serial, Network, Keyboard and Mouse ports, the units provides two additional USB ports. Dimensions:             4.50" X 3.00" X 1"